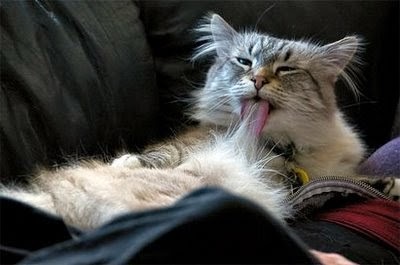 Cat hairballs form when excessive amounts of hair accumulates in the stomach and then later the cat coughs or vomits it up. Cats that have motility or digestive problems tend to have a more difficult time with hairballs. Feeding your cat a grain-free, high moisture canned or raw diet will improve your kitty's digestion and should improve the hairballs. Food allergies can be a trigger for digestive problems in cats. Grains and poultry, in particular, can cause digestive problems and increase the hairball problem To help your cat best, it is important to learn all you can about food allergies and use a few supplements to improve your cat's digestion, thereby reducing hairballs. Also, regular brushing can help reduce the amount of hair your cat swallows. Adding a purified fish oil such as Amazing Omegas will reduce shedding and improve coat quality. Power Probiotic is an excellent product for reducing hairballs and improving digestion. It sprinkles easily on food and improves motility. Soothing Digestive Relief helps relieve digestive discomfort and helps cats form normal stool.